What is Brickell Men’s Advanced Anti-Aging Routine? What’s to mention about the formula? What are the ups and downs of the kit? Taking care of the skin and making all the efforts to maintain a younger and healthier skin for a long time isn’t something that belongs only to women. Men are also entitled and interested into looking nicer and fresh for a good amount of time. When you don’t have the patience nor the time to look for every skin care product that you need to introduce in your routine, an advanced anti-aging routine is the best choice for you. The anti-aging routine by Brickell includes three of the best skin care products that are created to repair the skin cells, while lessening and preventing wrinkles. The set addresses to men of any age, no matter their skin type, who are preoccupied about reducing wrinkles and signs of aging. All of the three skin care products are natural and work together to minimize wrinkles and inflammation. They hydrate the skin and give it a fresh look, with no darker circles or puffy eyes. The Brickell Men’s Advanced Anti-Aging kit tightens and firms the skin, protecting the skin from future damage as well. The list of ingredients for the three skin care products is very long, but some are more important. We’re going to go in the details about some of them, so that you can better understand why the kit is able to fight aging of skin. Caffeine-it minimizes the effects of the free radicals on your skin. It increases the elasticity of your skin and reduces the appearance of fine lines and wrinkles. It smooths out redness and heals the skin damaged by sun. it tightens the skin and helps it look younger, removing the dark circles and puffiness. Hyaluronic acid-protects the skin from the damage of sun. It diminishes the fine lines and wrinkles, hydrating the skin. It moisturizes and smooths the skin, giving it a nice glow. Protein peptides- it’s a combination of protein peptides that are known to sustain the collagen production and minimize the wrinkles by 45%. Vitamin C-reduces the visibility of fine lines and wrinkles, fading out dark spots and age spots. It leaves the skin radiant and healthier looking. Aloe Vera- sooths the sunburns and calms the skin in psoriasis and eczema. It controls acne and moisturizes the skin. It reduces the appearance of stretch marks. MSM-is a nutrient common for various foods. It smooths out the age spots and other skin pigmentation conditions that are caused by aging of skin. Witch hazel- boosts up the healing process and it’s a good astringent. It’s anti-aging and blocks the cellular damage. It nourishes the dry skin and minimizes the appearance of puffiness. It alleviates the symptoms in razor burns and eczema, putting the acne under control. Sunflower oil- moisturizes efficiently the skin as it has a high concentration of Vitamin E. It offers protection to the skin against the UVs and helps with acne. It comforts the dry and itchy skin, speeding the healing process. Cocoa butter-it’s anti-oxidant and reduces inflammation. It’s a good moisturizer and keeps the bad UV’s damage away from the skin. Coconut oil- is hypoallergenic and calms the cracked skin. It’s a soothing ingredient for the dry and oily skin as well. It cleanses deeply the skin, leaving it hydrated and moisturized. It presents anti-bacterial and anti-fungal properties, protecting the skin from the sun’s damage. It reduces wrinkles and helps the skin fighting aging. Cucumber hydrosol-helps the oily skin look better, softening the skin. It brings comfort in wind and sunburns, moisturizing the skin. Jojoba oil-it controls and balances the oil production in skin, moisturizing it at the same time. It works for the acne-prone and dry skin too. It doesn’t clog pores and makes an efficient barrier for the skin, minimizing the effects of the outer aggressors. It calms the cracked skin and sunburns. It treats eczema and psoriasis and its nutty smell is a nice addition. CoQ10 (ubiquinone)- fights against aging of skin and boosts the collagen production. It also increases the elasticity of skin. All the three skin care products contain no sulfates, parabens, glycols, phthalates, silicones or petrochemicals. The formula doesn’t include PEG’s, gluten or synthetic fragrances. They’re all vegan and have never been tested on animals. The products are made with only premium organic ingredients. You should use them both in the morning and at night. Start by washing your face with some warm water and pat dry. You only need a pea size amount of the night serum for your face. Let it dry and continue with the anti-aging cream for men. Once it’s all soaked into your skin, use a small dab of the eye cream right under your eyes and around the eye socket too. A little goes a long way and the products have a nice consistency. They’re not greasy nor sticky and leave no residue either. The smell is subtle and combines the essential oils of peppermint, lemongrass and eucalyptus. 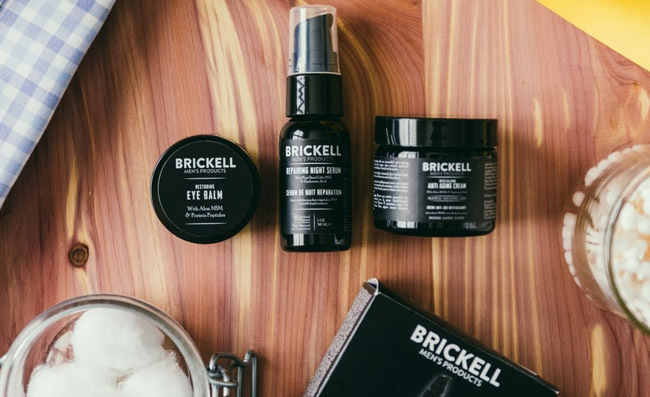 Providing you almost everything you need for a proper skin care routine, the set from Brickell is a valid option for the man that is interested into having a healthier and younger skin for longer time. Recent reviews on Sugar & Fluff Beauty: the Cosmedix Clarity Serum, the Chanel Le Lift Serum, the E.l.f Foundation Serum, the Oz Naturals Vitamin C Serum, the Grow Gorgeous Hair Density Serum Review.